3. Your roof top probably will not hold the weight of a deck as is, so most decks are built from parapet wall to parapet wall. (brick walls) If you share any wall with a neighbor as most row houses do you will have to have written permission from the owner of that building for you to build on the wall. The engineer will pull a plat of your property to see who owns what. 4. 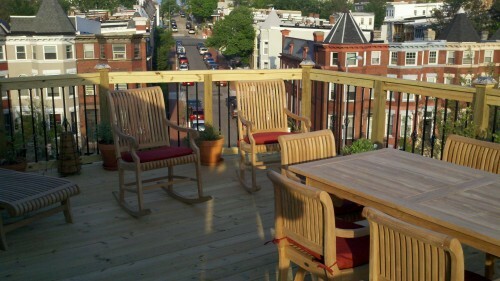 Depending on how DCRA Feels the day you apply for the permit they may also ask you to get permission from any other surrounding neighbors who may or may not have a concern about a roof top deck being added to the neighboring property. 5. 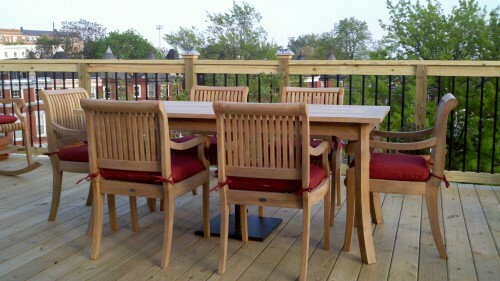 Once the plans are complete and you have a permit from DCRA you hire a builder of choice, most any builder can build the deck, the details are in the engineer you used who did all of the legwork with the drawings and permit. When in doubt ask for suggestions from your engineer. 6. Consider how the contractor will get the wood up to your roof, consider having your roof covering updated when building the deck as it would be harder to do so later if the covering is getting near the replace date, consider where the contractors will park and where the lumber will be unloaded and stored. If you do not have roof access (i.e. a door to get out on your deck and stairs) then that will increase the cost obviously. 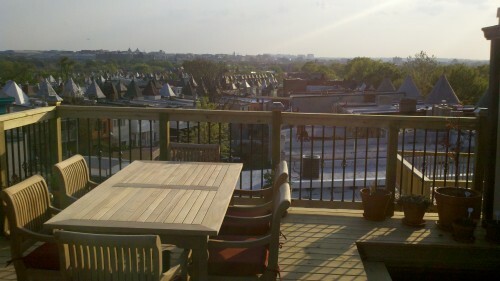 DC code says no gas grill with a propane tank can be located on any roof top deck, and must be 10 feet from any structure, you can however have a natural gas grill hooked into your home gas line (professionally done) or an electric grill.